When I’m playing through a massive open-world video game, sometimes the little tasks I do line up to create the perfect mini adventure. Maybe it’s by design, maybe by accident. Regardless, when it happens, it’s quite nice. 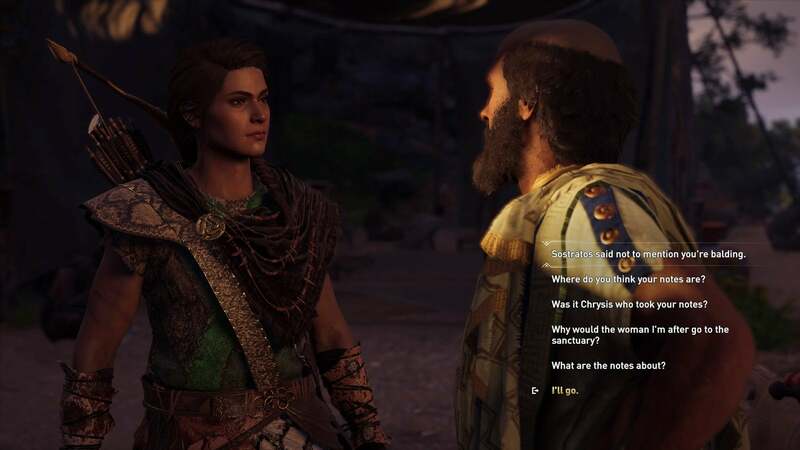 Let’s look at a sequence I just experienced in Assassin’s Creed Odyssey when, as is my style, I was avoiding the main quests and was ambling through more of the side stuff. I’d only been able to play Odyssey in fits and starts through much of October, and by late in the month had finished exploring Athens and hit what I assume is still a fairly early-game chapter break. 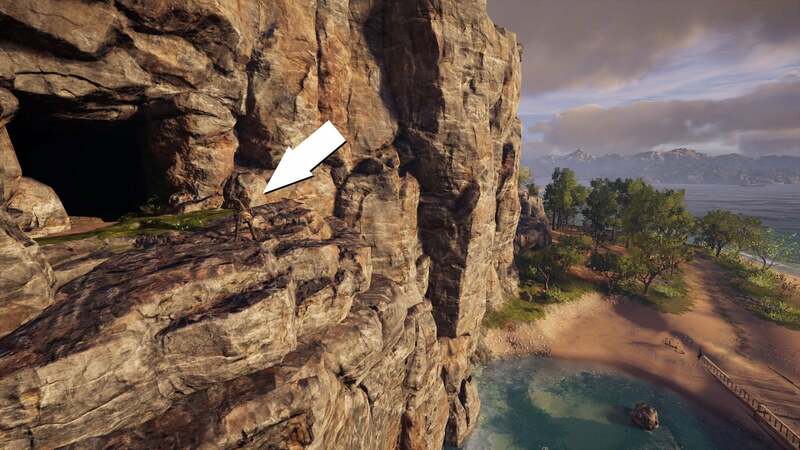 I had left Athens, sailed south out of a big bay, found a nearby volcano, scaled it, jumped into it, survived and then started playing Red Dead Redemption 2. I returned to Odyssey a few days ago with about two weeks of gameplay rust and forgetfulness about what I had been doing. I crossed a strait southwest of the volcano to reach the stubby peninsula of Argolis. I found myself at the foot of a hill, climbed it and encountered a group of hostile people. They were armed bandits or cultists or something and were camped around an oddly gnarled column. My map designated this location as Club of Herakles, and my character, Kassandra, muttered something about a club. I’d taken a long break from the game but recalled that I’d discovered a cult and also a faction called the daughters of Artemis. I figured there must be a club of Herakles, too, and, hey, maybe I just hadn’t met its leader or been introduced to it via an official quest yet. 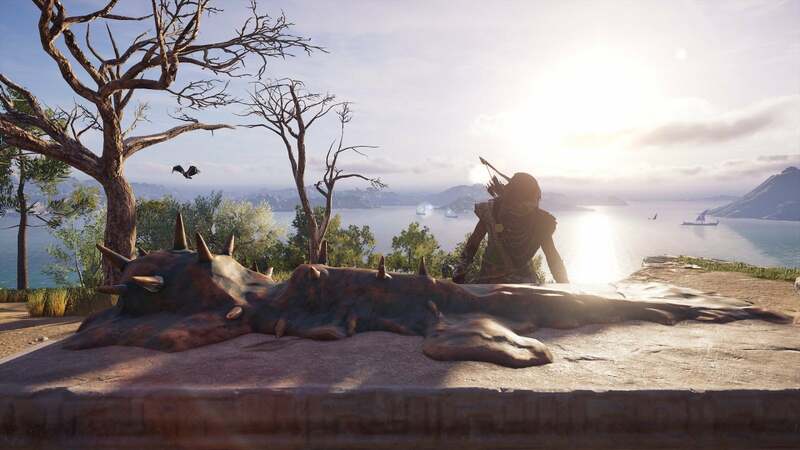 Every named location in modern Assassin’s Creed games has a checklist of basic activities associated with it. This one had four, one of which involved a treasure chest at the foot of the big column. I opened it and got credit for looting the one piece of treasure in that area. There were three more items on the list: kill the captain, find the ancient tablet, kill the cultist guards. Check, check and check. I moved on. I figured I’d learn more about this club later. Soon, I went to bed. A couple of days later, I played Odyssey some more. I trekked north in Argolis, turning more unnamed locations on my map into named spots along the way, doing many of their checklists of activities and eventually heading far enough north in the region to reach the city of Argos, where I did do some main quests and was sent east to meet someone famous. Sure enough, I soon met Hippocrates, that famous doctor who’d have that whole oath thing. Another character warned me to not mock his bald spot. Bless this game for giving me the choice. Hippocrates gave me some main quest stuff to do, but I am not taking the highway in this game. I’m travelling the backroads route. I let the Hippocrates conversation trigger a bunch of new quests in my quest log and then ignored them so I could poke my head into a seemingly unimportant cave nearby instead. The cave had brought me to a cliff. The cliff gave me a reason to dive. The dive gave me impetus to soak in the surroundings and follow a path to a strangely named nearby location called Bronze Club of Periphetes. This time, the “club” in question clearly referred to a weapon that was being guarded by some bad guys. The “bronze” gave it away. I spotted some guards and killed them. Nearby, I found the bronze club. It was melted onto an altar and looked very unusable. I thought about it a bit and checked my map. The Valley of Dreams was south of me, near the location where some of the Hippocrates quests were sending me. The way I read the clue, there were two “clubs” down there. I realise that’s a misreading now and I partially attribute it to the fact that a treasure map quest I’d recently pursued in Red Dead Redemption 2 involved finding a pair of stone pillars. For this clue, I figured I’d go south, head to an elevated point and spin the camera around. Maybe “club” was a metaphor for pillars like the ones I’d seen in Red Dead. I’d be looking for a pair and climb the bigger one. I climbed a high point. I spun the camera around, but I didn’t see any columns. Ohhhhhhhhh! Of course. How did I not get this right away? In retrospect it’s all so obvious and probably makes me look dopey for not immediately realising what “Club of Herakles” or that clue I later found meant. Sometimes, though, you just don’t make connections and carry many of these half-understandings in your mind as you play a game and eventually solve its riddles. I’m charmed by how this all flowed. In retrospect, I can see how I was gently nudged through all of this. The volcano wooed me away from Athens. The Club of Herakles was a highly likely location for me to visit right after leaving the volcano. The cave near Hippocrates may have been unimportant in terms of questlines, but its proximity to a major quest-giver was likely a lure to get me to walk through a cave that would funnel me out into a beautiful new micro-region. And that region’s curiously-named Bronze Club location would be too intriguing to avoid exploring. Of course, it would contain a clue designed to drive me back to that very first spot I and many other people probably reached in Argolis. It all formed a perfect, satisfying circular path. The game didn’t mandate I do just about anything I did in this sequence of events. 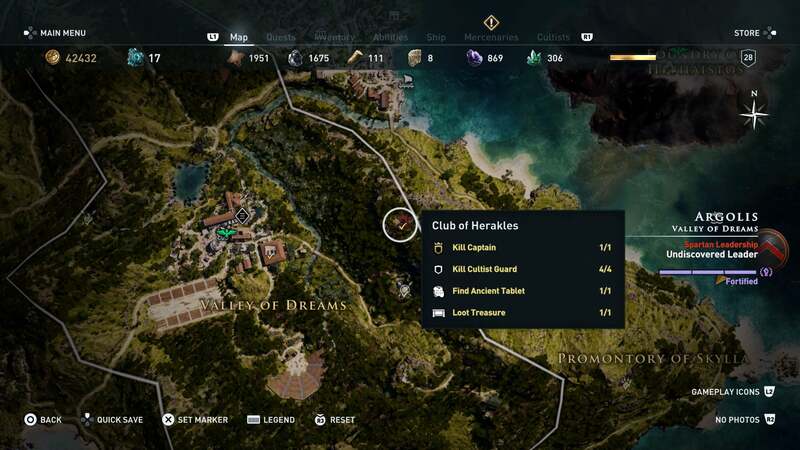 Nearly all of the places I went, objectives I cleared and the clue I found and solved were not part of any named sidequests, let alone any of Odyssey’s main quests. It was all stuff that might seem like window-dressing or filler to some players. 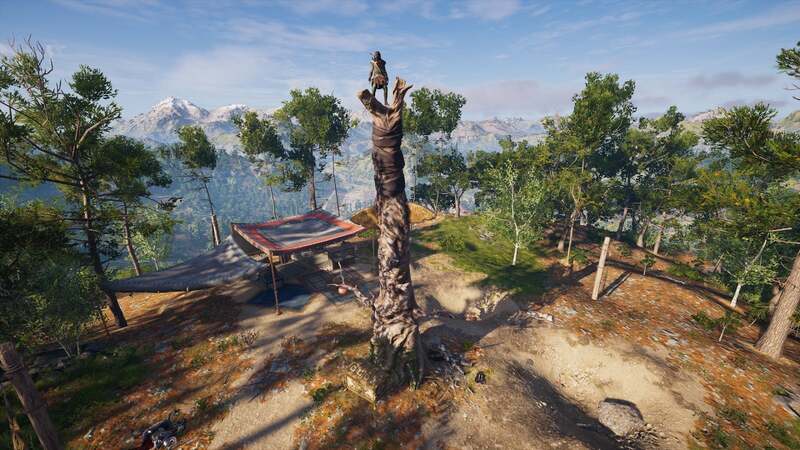 To me, it represents the care put into the layout of the game’s virtual land and it shows how smartly at least this region in Odyssey was seeded with points of interest that could be connected into an enjoyable, surprising side adventure. It’s great when a game can click like this and when you’re in the midst of some of its most satisfying adventures without even realising it.